How are krill adapted to survive in Antarctica? Physiological - The internal functions of the animal from biochemical, to cellular, tissue, organ and whole organism level. These adaptions work in combination. Very fine filtering net or "basket" formed by 6-8 pairs of fore-limbs that can capture phytoplankton down to 1Âµm (1 micrometer, a millionth of a meter), this is the smallest that phytoplankton there are, no other zooplankton of this size can do this so it allows krill access to the maximum amount of food. 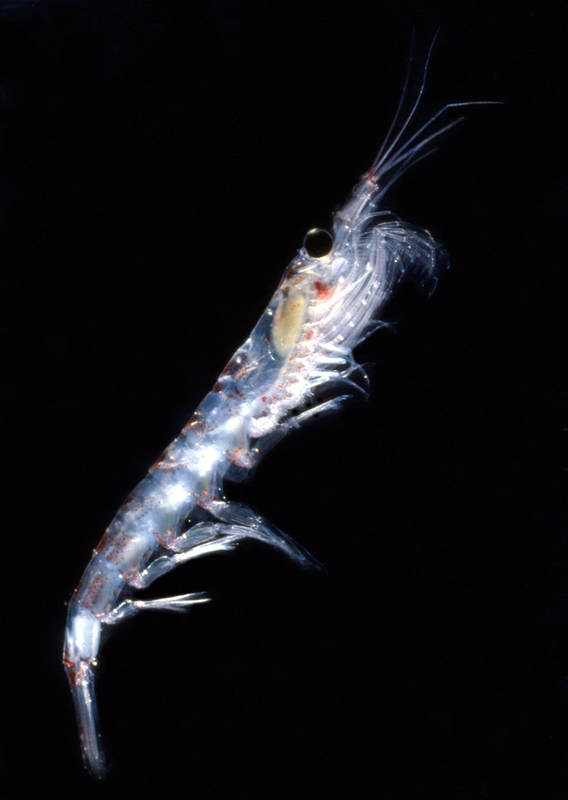 In the picture to the right a 1µ sized object is seen on a krill filter. Other limbs have scraping setae rather than filtering setae, these are used extensively during the winter months by krill to scrape phytoplankton off the underside of sea ice where there is still enough light penetrating to allow food to grow. Small bioluminescent organs are found on several regions on a krill's body, they have a reflector at the back, a lens at the front and can be directed using muscles, the function is not fully known, it may be connected with schooling or mating. 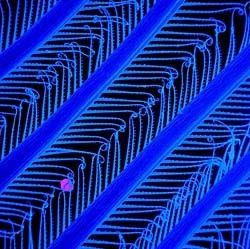 For this reason krill are sometimes called "light shrimp"
Complex and highly developed compound eyes, one of the best visual structures in nature, though why this should be so in krill is a mystery. Swarming behaviour similar to schools of small fish as a defence against predators, such swarms can have up to 10,000 to 30,000 individuals per cubic meter of sea water. This may be useful against small predators that target individual krill, but is useless against larger filter feeders such as some seals and whales. In the winter and spring they are found beneath sea ice where they feed on algae growing on the under side of the ice. Rapid backwards escape reaction. In common with many other crustaceans that have a pronounced flattened tail (telson), krill can flip the telson and shoot backwards several times in succession to quickly escape from danger - this is called "lobstering", you can probably guess why. Usually krill stay in deep water during daylight hours and come to the surface at night, this helps them to avoid predators. They have also been shown to spend longer at depth and to go deeper in the water column when they are near to land and predator colonies such as penguins and other sea-birds. They will drop to 80-100m or more (260-330 feet) in the daytime by "parachuting" down, slowly sinking with outspread limbs and then swim back up to within 10m (33 feet) of the surface at night to where the phytoplankton can be found and when predators are relatively less of a threat. Female Antarctic krill can lay up to 10,000 eggs at a time, they can do this several times in a season.